Defence Secretary Gavin Williamson said: “Britain is a world leader in the space industry. These figures show that we’re developing pioneering satellite technology which will help to guarantee our national security in the future and maintain a military advantage over our adversaries. Spire Global is a satellite and data analysis company that was founded in San Francisco and set up its European headquarters in Glasgow, where it has built more than 80 satellites since 2014. The company specialises in data from small satellites in a low-earth orbit. In February 2018, the UK Space Agency awarded more than £4m to Spire to demonstrate cutting-edge space technology, including parallel super-computing. The UK Space Agency is also supporting a space incubation centre in Glasgow and has provided support over several years to the Scottish Centre of Excellence in Satellite Applications, based at the University of Strathclyde. Thales Alenia Space in the UK was established in 2014 with offices in Bristol, Harwell and Belfast and is a leader in propulsion systems, Earth Observation and Science mission subsystems, and next-generation payloads for telecoms, military satellites and satellite constellations. Belfast is home to Thales Alenia Space’s multi-million-pound Electric Propulsion Integration Centre, delivered in 2016. The site recently delivered the first all-electric propulsion module designed and built in the UK, the Spacebus Neo Xenon Propulsion System (XPS). 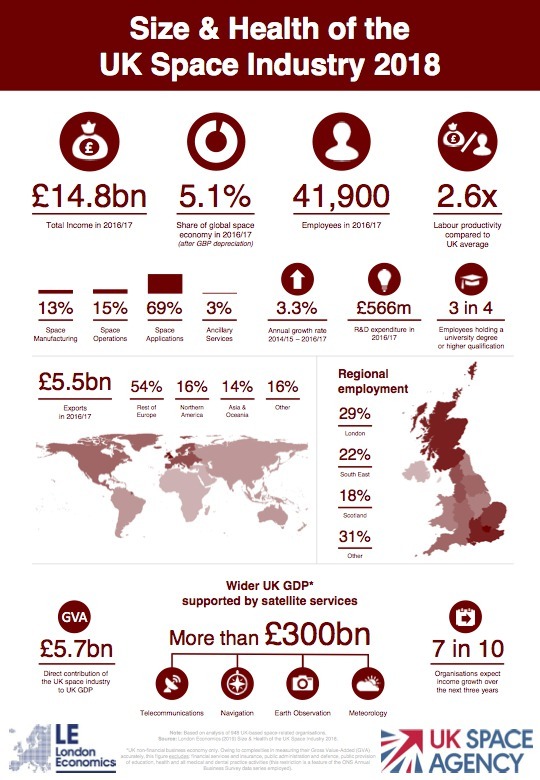 The company’s space-related jobs in the UK have grown from 10 in 2014 to 200 in 2018 based across Belfast, Bristol and Harwell. That total is estimated to grow to 350 by 2020. Since forming in 2013, Oxford Space Systems has raised more than £10 million to build innovative and lightweight spacecraft antennas and deployable booms which are lower cost than those currently available to commercial satellite manufacturers. In 2015, the company was selected for the UK Space Agency’s AlSat Nano mission, achieving a world-first with the longest ever retractable CubeSat boom in orbit at 1.5 metres. It currently employs around 30 staff but is set to expand significantly and recently moved to a new headquarters at the Harwell Space Cluster. This week the MOD announced a £1 million investment in the development of an innovative ‘wrapped rib’ antenna by the company. Click here for the full report (31 PDF pages) on the UK Government website.